Vince Lim grew up in the beautiful paradise of Hawaii. 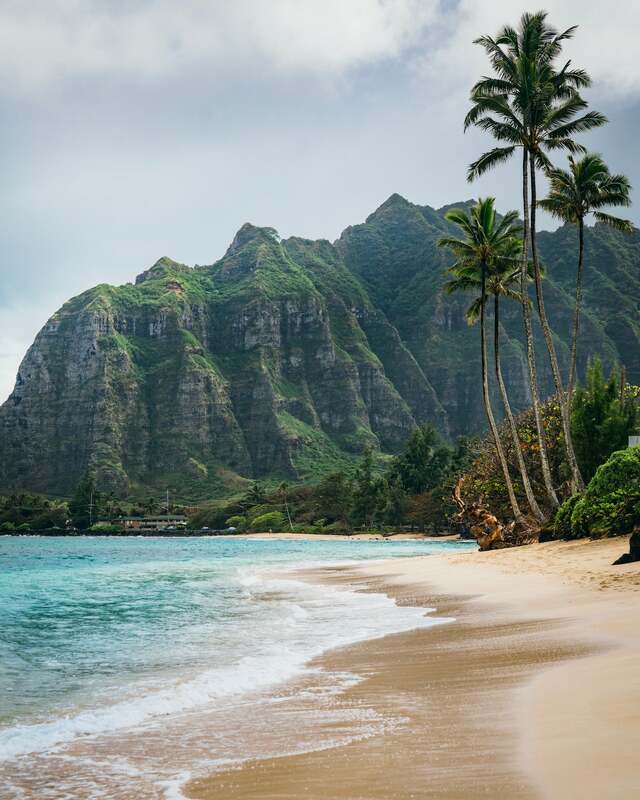 The stunning landscapes of the Hawaiian islands inspire him to get up and make photos every day. Although he’s only been shooting at a high level for a few years, Lim has collected more than his share of accolades and a strong and engaged following on Instagram (@vincelimphoto). Among the crowded field of landscape photography, Lim strives to create images that are unique among subjects that have been photographed by many others. His success is self-evident. We caught up with Lim, who is also part of the Sony Alpha Imaging Collective, to find out more about the gear he uses for landscapes. People say that the best camera is the one you have with you, and this compact camera can be put in my pocket and be taken everywhere I go. And it has an amazing 1” sensor which creates image quality beyond what you’d think it could. 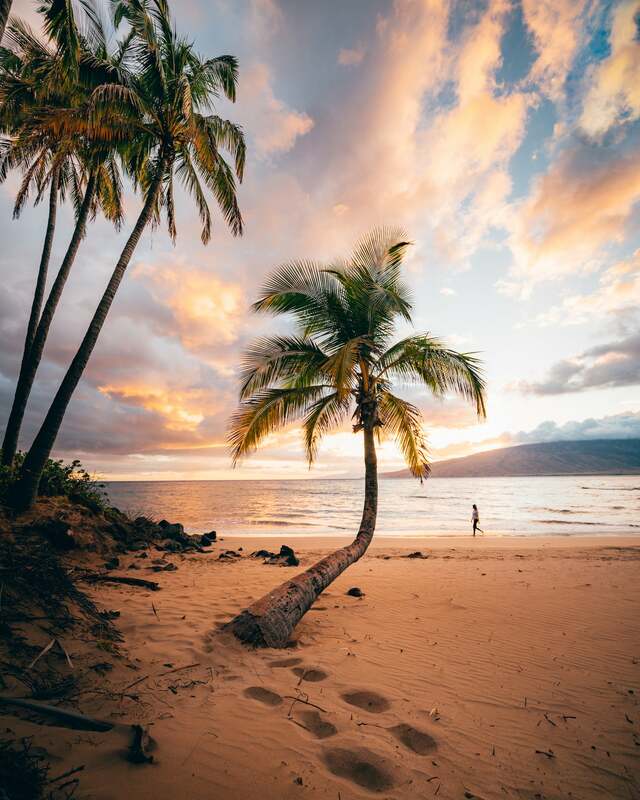 Growing up in Hawaii, I’m surrounded by an ocean and an incredibly diverse landscape. I fell in love with the outdoors, and I enjoy capturing the beauty of what this place has to offer (and there’s a lot.) I wanted to give you a glimpse of the gear I use on a daily basis when I’m hiking, finding a waterfall or shooting by the water. Sony α7R II: The α7R II was my first Sony product and it has stuck with me throughout my photo journey. As a landscape photographer, the image sensor provides me with outstanding results, from its dynamic range and its 42 megapixel resolution. 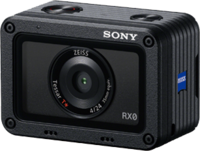 Sony RX0: The RX0 is a great tool to have in my bag. I use it to capture moments I wouldn’t be able to with my α7R II. 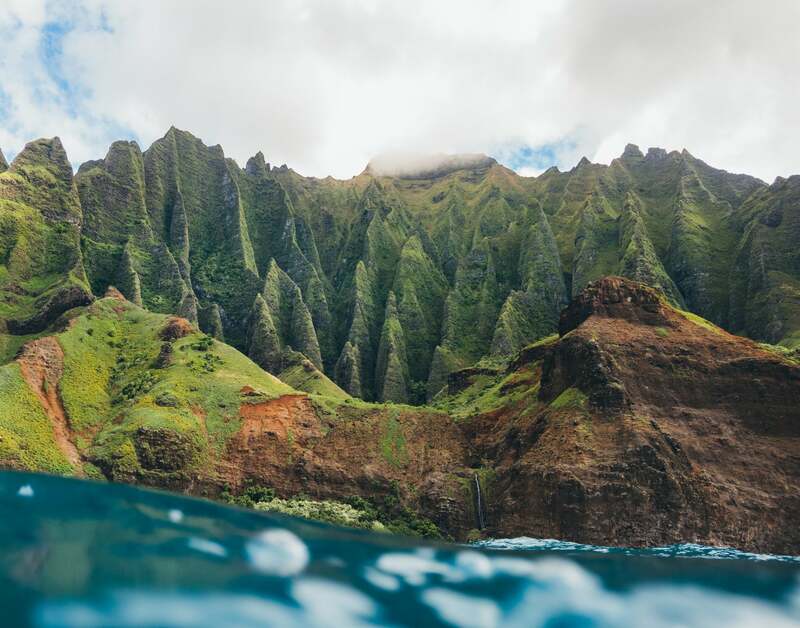 On a recent journey to Kauai, the waterproof and shockproof camera was ideal for taking photos in the water. People say that the best camera is the one you have with you, and this compact camera can be put in my pocket and be taken everywhere I go. And it has an amazing 1” sensor which creates image quality beyond what you’d think it could, I took the photo below with the Sony RX0 on Kauai. We took a boat to see the iconic Napali Coast and anchored in front of a popular spot called the “Cathedrals.” I jumped over the side of the boat with the RX0 to get a low perspective from in the water. Sony 24-70mm f/2.8 G Master: This lens is my workhorse. The 24-70mm provides the versatility to shoot in any situation. The ability to open up to f/2.8 is what makes this lens unique, and I can always rely on the image quality from the G Master lens. If I could only choose one lens to use for the rest of my life, it would without question be the 24-70mm f/2.8 G Master. In the shot below, I zoomed in to 55mm to capture the beautiful mountains range and palm trees. There’s so much detail from the G Master on my α7R II. Sony 12-24mm f/4 G: The 12-24mm lens is one that I’ve recently been using a lot more. I previously used a 16-35mm quite a bit, but I was in search of a bit wider perspective. I immediately fell in love with the 12-24mm f/4 G and it’s amazing how much I am able to fit into one frame. The light weight of the lens also makes it easy for me to handle. I was really surprised by how little distortion there is when shooting at 12mm. I took the photo shown below at 12mm. I was actually only a few feet away from the palm trees but this focal length made it possible to create a dreamy lifestyle photo. I think this is a great lens for any photographer. Sony TOUGH SD Card: You can never have enough memory cards, right? I rely on the Sony TOUGH SD cards to protect my images from the elements. With the varying terrain in Hawaii, it’s a must-have memory card. Sony PRO Support Strap: Joining Sony PRO Support is a no-brainer and the PeakDesign strap was a nice perk. Zeiss Cleaning Kit: Having a cleaning kit on hand is a must, and to achieve great images, you need to take care of your equipment. In the field, I rely on this kit to clean my camera and lenses. Polarizer: A polarizer is a tool every landscape photographer should have in their bag. It really helps reduce glare in photos and also allows me to retain proper exposure without the sun blowing out the image. When I’m taking photos by the water, I always have this on my lens. Tripod: A tripod is definitely in my bag, and even though I make use of the IBIS system (In-Body Image Stabilization) in my α7R II and take most of my photos handheld, there are situations like astrophotography or low light, where using tripod is a must. Headlamp: Chasing early sunrises and late sunsets means I’ll be doing a lot of hiking in the dark, and I can’t stress enough how essential it is to have my hands free when hiking in the dark. Safety is always at the top of my mind, and you are at a disadvantage in the dark by having one hand holding a flashlight or a phone. A headlamp can also be a great tool for light painting photos in the dark! 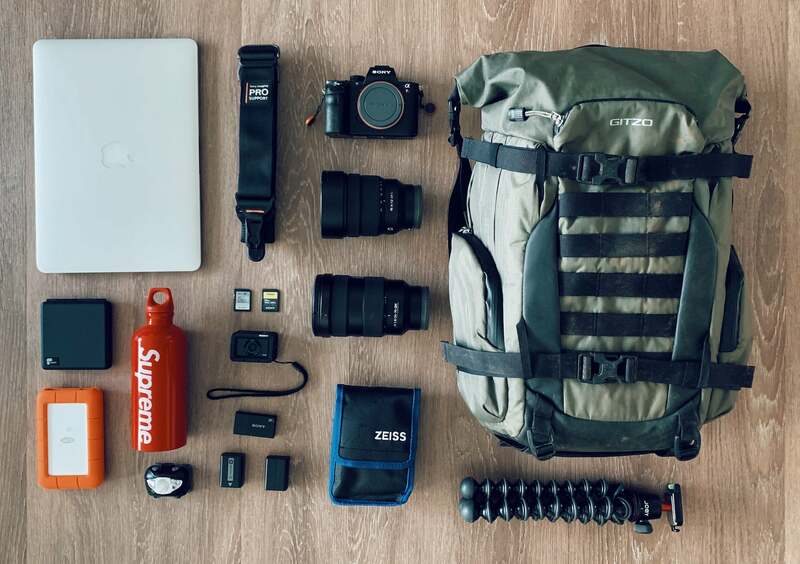 Backpack: As every photographer knows, finding the right backpack is very important. I’ve gone through several in my time, but I really believe I found the right one in the Gitzo backpack. It's incredibly well constructed, and fits every need I’m looking for in a bag. Laptop & Rugged Hard Drives: For editing and managing images on the go. Supreme SIGG Water Bottle: Keeps me hydrated and keeps plastic out of the ocean. Vincent Lim is a member of the Sony Alpha Imaging Collective. Follow all of their adventures on Instagram https://www.instagram.com/vincelimphoto/.